Acknowledged author wrote INTRO TO AGRICULTURAL ECONOMICS 7 comprising 432 pages back in 2016. Textbook and etextbook are published under ISBN 013460282X and 9780134602820. 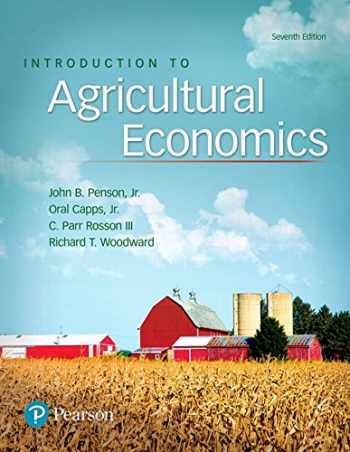 Since then INTRO TO AGRICULTURAL ECONOMICS 7 textbook received total rating of 4 stars and was available to sell back to BooksRun online for the top buyback price of $69.33 or rent at the marketplace. A systematic overview of the economic forces influencing the food and fiber industry . Introduction to Agricultural Economics provides students with a systematic, building block introduction to the basic economic concepts and issues impacting the U.S. food and fiber industry today. Thorough coverage of microeconomic and macroeconomic theory, the role of government, and international trade policies allows readers to gain an understanding of domestic consumers and overseas markets. Each chapter offers extensive review opportunities that let students test their knowledge of important concepts and prepare for exams. The Seventh Edition has been thoroughly revised to provide the most up-to-date coverage of the dynamic food and fiber industry within the global economy.